I ate a really fantastic chunky avocado toast on the beach in Miami a couple weeks ago, then came home and promptly recreated it. It was the chunkiness of the avocado toast that I loved the most. 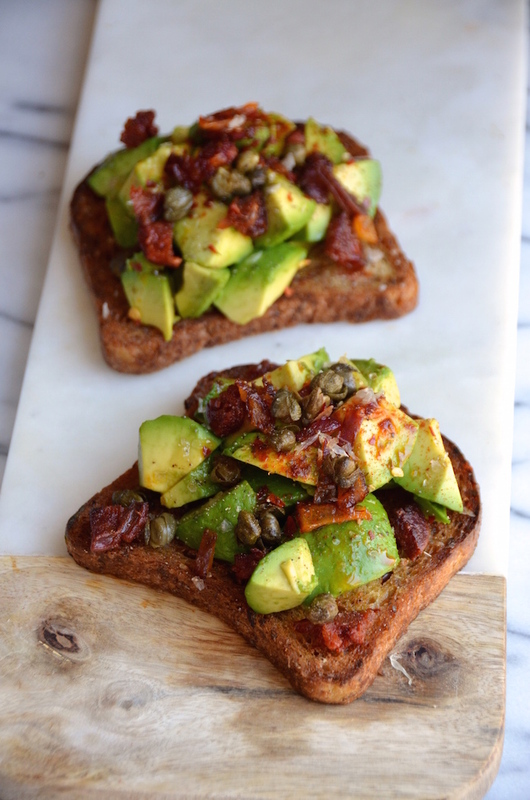 Most avocado toast recipes feature either a spread of mashed avocado OR very thin slices. Both are lovely (I mean...it's avocado. Hard to go wrong...), but I loved the big chunky version with thick and creamy cubes piled high on bread, then garnished into something beautiful. I like a whole grain bread, preferably with seeds or nuts. One of my current favorites is a low-carb flax bread that actually tastes amazing (My husband requests it over regular bread--for reals!) You can go with something hearty and thick, or even a regular sandwich slice. But skip the toaster! Instead, drizzle a little olive oil or butter on a hot skillet and fry the bread until it's toasted and golden on all sides. Sprinkle it liberally with salt before moving onto the next step. It needs to be ripe! This takes equal parts practice and luck. The avocado should be soft to the touch, but not mushy. Dark, but not TOO dark. You want it as ripe as it gets before it turns brown. The one in this picture is close, but could be even softer (I was impatient). Chop it up into thick chunks; they don't have to be even. Pile them high on the fried bread. I went with chorizo, which is my most favorite thing in the whole world. Thin slices of the Spanish kind, fried until crisp in a bit of olive oil. I then tossed some capers into the hot oil and let them pop and crisp all over. I sprinkled and tucked these in, over, and around the avocado. Now you have to bless the whole thing with a bit more olive oil and a generous sprinkle of good and flaky salt. (I love Maldon salt, which has giant crystals that you crush with your fingertips.) For this version, I drizzled on the hot oil that I used to fry the chorizo and capers. I think you should do the same! Now tell me...what do you like to eat on your avocado toast? Preheat a heavy skillet over medium-high heat. Add the oil and the slices of bread and fry in the oil until golden and toasted on all sides. Remove bread from pan and set aside. Add the diced chorizo to the hot pan, and cook until crispy. Add the capers in right at the end, and saute just for a few seconds until they crisp and pop. Remove from heat. Peel and dice the avocado into large chunks. 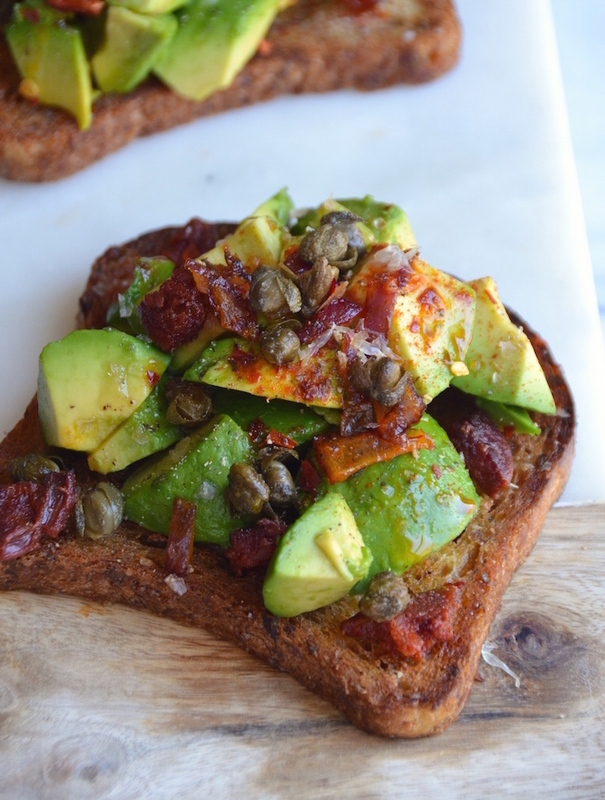 Pile on the toast, then top with the fried chorizo, capers, and any oil from the pan. Sprinkle with salt and a good squeeze of lime.